In the beginning, there were boxes. They came on big boats from across the ocean (some from China, others from Rotterdam), and they were gradually unpacked to make a new home. That was seven years ago. Now, the time has come to move again. Not far, mind you: Just a few blocks, to a new location even closer to Montréal's core and within spitting distance of its most important place of worship - the hockey stadium. The proximity of the old and new home does not change, unfortunately, the need to pack up an entire household and transport it down three flights of stairs, and up the same number again. And that makes for a comeback of boxes. Lots of boxes. The nature of my last move meant that many of my goods were delivered: Either brand new by the employees of a large Swedish company, or shipped from Europe to my doorstep by burly freight forwarders. No such luck this time. Instead, I found myself tossing and turning in bed as I went through various scenarios and schedules for when which belongings need to go into what receptacle so as to make the journey in the right order. Like anyone else in Québec, I will hand over the keys of my old place on July 1st, the province-wide moving day. 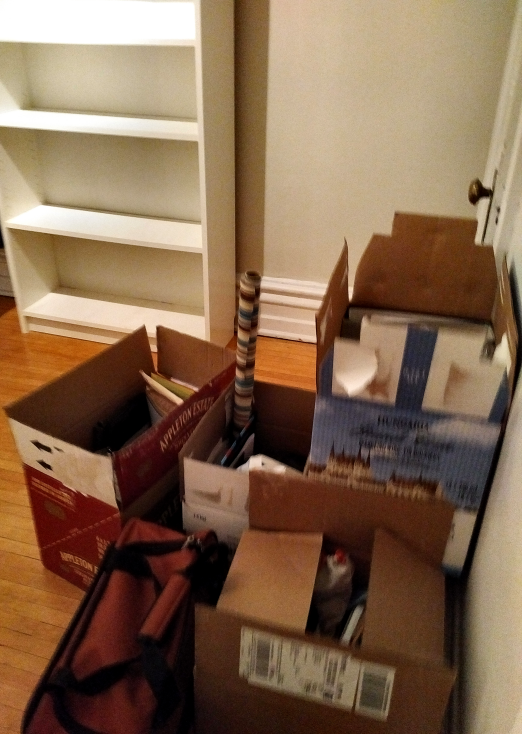 But fortunately, I have the opportunity to place items in our new home in the preceding week, once that space is clear of the previous tenants' belongings. At the same time, I need to keep a skeleton version of my old household going until I myself move, for I will continue to require chocolate, fresh underwear, deodorant and other basic necessities. That made for a brain-twisting planning exercise, further complicated by the merger of two households into one and a few renovations. Surplus was inevitable, and while my instinct would have been to deposit any and all unwanted items on the curb, I was instead taught the art of virtual garage sales - the proceeds of which were swiftly spent at bewildering stores named "Home Depot" (a retail category largely inexistent in Switzerland, where pro work is expected and contractors are hired for it). Canadians, unfortunately, insist to do it yourself. So the Swiss passport is definitely handy - as an excuse. With the planning all done and precisely two weeks remaining until the current apartment is but a Souvenir, things are now moving to the execution stage. In other words: Into boxes. And as with most projects, that is when the heavy lifting starts. At least I have learned not to worry about cleaning up the old place. If things go well, and emerge from boxes unscathed, the next entry in this blog will be written on the same keyboard, at the same desk, but in a different room of a new home. And going by its location, that home will truly be our castle.